a wizard playing a piccolo? 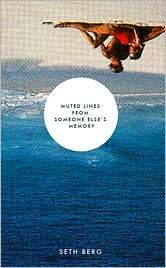 The morning I removed my air-conditioner from my window was the morning I sat down and read Seth Berg’s poetry collection Muted Lines From Someone Else’s Memory. With the air-conditioner gone, there was new light in my room and a nice, nibbling chill in the air despite the cloudless, September blue. As I read Seth’s words—sweatshirt on, hood drawn tight beneath my chin—the realization that summer was almost over and all things move forward snapped firmly into place. The poems in this collection are caught perfectly in that forward motion, sometimes reaching back like a sad smile in a crowd, a memory urging us to follow. They offer a true sense of the cyclical nature of things, inviting us to look up, down, backward, and within. These poems put your head on a swivel, but delightfully so. inhaling like a stupid typhoon. While Berg writes about the inescapable, forward propulsion of life, he also reminds us of the doors that come with it, the blurred lines along the edges, the shape of things, of our memories as they evolve, and he encourages us to push through, a hand breaking the surface of the water, and then dragging, slowly, downstream. The result is a dreamlike, often playful understanding of the things that surround us and comprise our lives. Childlike wonder is a theme that permeates this collection, but it’s not exclusive to children: the narrator of these poems grapples with the effects of accidents and aging, and uses it, perhaps unwittingly, to move closer to that dream world all around us. something sinister behind my fragile back. In Muted Lines From Someone Else’s Memory, Berg shows us the importance of pondering the small things, the silly things, the serious things. We’re constantly shifting and changing every day, minute, second. These poems lean into the wind, into God (whatever or whomever that may be), with chin tucked and eyes open, and walk forward, bravely, beautifully. Purchase Muted Lines From Someone Else's Memory HERE.